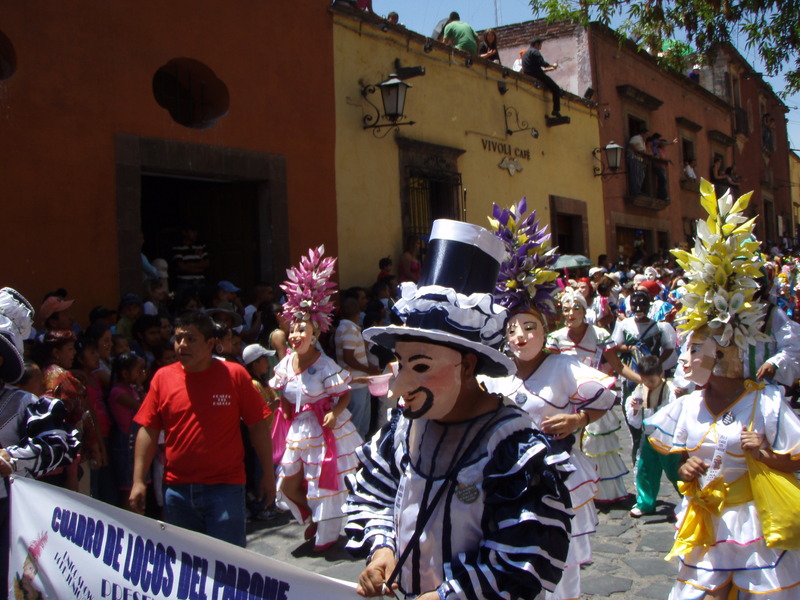 Once a year, on the first Sunday after the feast of San Antonio de Padua (June 13th), the entire community of San Miguel de Allende lets its hair down for the town’s most imaginative event of the year: El Desfile de los Locos or the Locos Parade. Los Locos resembles Mardi Gras in New Orleans, only on a much smaller scale. Teams from different barrios (neighborhoods) spend weeks creating floats, working up dance routines, and fabricating crazy costumes for the parade which starts in the San Antonio neighborhood and windsthrough a number of San Miguel’s major streets to reach the Jardín. As with Mardi Gras parades, candies are tossed from floats and off the backs of pick-up trucks. Spectators, who line San Miguel’s streets hours before the parade arrives, often bring umbrellas to turn upside down and catch more candies. Outrageousness is the order of the day, the more fantastic a costume is, the more the crowds appreciate it. And while Mexican men are often thought of by outsiders as macho, trans-dressing is hugely popular during Los Locos. Men who are dressed up as models, female celebrities, nuns, geishas, witches, or female action characters draw cat calls and the most laughs from the audience. The party continues long into the night with music, dancing and fireworks in the streets around the plaza of the San Antonio church.